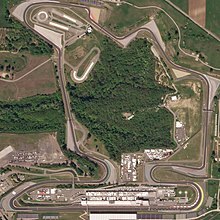 The Hungaroring is a motorsport race track in Mogyoród, Hungary where the Formula One Hungarian Grand Prix is held. In 1986, it became the location of the first Formula One Grand Prix behind the Iron Curtain. Bernie Ecclestone wanted a race in the USSR, but a Hungarian friend recommended Budapest. They wanted a street circuit similar to the Circuit de Monaco to be built in the Népliget – Budapest's largest park – but the government decided to build a new circuit just outside the city near a major highway. Construction works started on 1 October 1985. It was built in eight months, less time than any other Formula One circuit. The first race was held on 24 March 1986, in memory of János Drapál, the first Hungarian who won motorcycle Grand Prix races. According to a survey put together by the national tourism office of Hungary, Mogyoród ranks third among Hungarian destinations visited by tourists, behind the Danube Bend area and Lake Balaton, but ahead of Budapest. The circuit has FIA Grade 1 license. The Grand Prix is held in the middle of summer, which is usually extremely hot and dry in this region. Its first wet Grand Prix race was in 2006. The circuit is normally dusty due to underuse throughout the rest of the year and its sandy soil. As the circuit is in a valley about 80 percent of it can be seen from any point. Normally, an underused circuit becomes faster over the weekend as the track surface gathers more rubber residue; however, with the Hungaroring this generally does not happen, because the track can get dusty so quickly. The track frequently becomes faster during a qualifying session, which leads competitors to try for their best lap as late as possible. The twisty and bumpy nature of the circuit makes overtaking very difficult in dry conditions, the circuit is nicknamed "Monaco without the buildings" for this reason. Nonetheless, the Hungaroring has been the scene of several memorable races such as the duels of Nelson Piquet and Ayrton Senna, Nigel Mansell's lost wheel in 1987, Mansell's win from 12th on the grid after a dramatic pass on Ayrton Senna in 1989, Damon Hill's almost victory with Arrows in 1997, Michael Schumacher's change in strategy to beat the McLarens of Mika Häkkinen and David Coulthard in 1998 and maiden wins for Hill in 1993, Fernando Alonso in 2003, Jenson Button in 2006 in the track's first ever wet Grand Prix, and Heikki Kovalainen in 2008. Hungaroring has crowned two drivers in its 20-year history: both Nigel Mansell in 1992 and Michael Schumacher in 2001 were able to win the World Championship title. Moreover, the WilliamsF1 Team and Scuderia Ferrari also secured the Constructors' Championship at the Hungaroring, Williams in 1996 and Ferrari in 2001, 2002, and 2004. Both Hungary's Zsolt Baumgartner and Poland's Robert Kubica made their debut on this track as the first F1 drivers of their countries. The 2006 Hungarian Grand Prix was the first wet grand prix at the Hungaroring. This saw the retirement of many drivers including championship rivals Fernando Alonso and Michael Schumacher and gave Jenson Button and the reborn Honda F1 team their first win. Fernando Alonso also earned his first Grand Prix victory at this in 2003, declaring it his favourite track as a result. According to statements and interviews, drivers have different opinions on the track. While many, like Ayrton Senna, Nigel Mansell, Michael Schumacher, Lewis Hamilton, and Fernando Alonso claimed to love it, many others consider the track too slow, hot and demanding. The technical driving center of the Hungaroring held former racer Gerhard Berger's name from 1998 until 2005 but later it was changed to Allianz. The track also has named curves: Turn 4 is named after Nigel Mansell, due to him losing a wheel there during the 1987 Hungarian Grand Prix. Turn 11 is named after Jean Alesi following his massive crash there during qualifying for the 1995 Hungarian Grand Prix. On Saturday, 25 July 2009, in the second qualifying round for the Hungarian Grand Prix at Hungaroring, Ferrari driver Felipe Massa's head was injured, though protected by his driver's helmet, he was struck by a suspension spring that had fallen from Rubens Barrichello's Brawn GP car while driving at high speed. He was knocked unconscious, and subsequently crashed head-on into a tyre barrier. Massa was thereafter airlifted to the ÁEK hospital in Budapest, where he underwent surgery in the area surrounding his left eye. His condition was initially described as "life-threatening but stable", but improved rapidly. Massa was discharged from hospital the following week and returned to Brazil. After further tests it was decided that Massa needed a titanium plate inserted into his skull to strengthen it for racing in Formula One again. While most of the foreign fans are from Germany and Austria, the Hungaroring has traditionally seen a large influx of Finnish fans as well. With the loss of the Austrian Grand Prix in 2003, this became the closest Formula One event for fans from other Central European countries. However, the Austrian Grand Prix returned again in 2014. The 2006-10 races saw many spectators from Poland due to the participation of Robert Kubica. Some say that the Hungaroring is similar in style to Circuit de Monaco, due to its tight and twisty corners. The first change in the track's layout was carried out in 1989, when the chicane after the actual turn three (a temporary measure put in during construction due to the discovery of a spring where the direct route was due to run) was removed by culverting the stream. In 2003, the main straight (turn one, see diagram) was lengthened by roughly 200 m (660 ft) to 908 m, and the hairpin at the end of the straight was also tightened in an attempt to facilitate more overtaking opportunities, as well as a tightening of what was turn 12. The contract was prolonged until 2021, although tobacco advertising has been banned since 2007. The Hungaroring is the home of Hungarian motorsport. Besides Formula One, it has also hosted the DTM and FIA GT Championship races. In 2011, it hosted the inaugural FIA WTCC Race of Hungary. A public drag race event takes place every month. ^ "Hungarian Grand Prix". CNN. Archived from the original on 24 December 2007. Retrieved 24 February 2008. ^ "Formula One:a way of fine-tuning an image". International Herald Tribune. 26 September 2003. Archived from the original on 4 August 2008. Retrieved 25 February 2008. ^ "Hungaroring, Hungary". BBC News. 29 June 2007. Retrieved 18 February 2008. ^ a b "Formula one races draw in fewer fans in Europe". American Chamber of Commerce in Hungary. Archived from the original on 2 March 2006. Retrieved 2 March 2008. ^ "Welcome". Hungaroring Sport Plc. Retrieved 25 February 2008. ^ "Formula One: Think it's a joyride? Try some laps on Hungary's course". International Herald Tribune. 17 August 2002. Archived from the original on 4 June 2011. Retrieved 27 February 2008. ^ "A history of the Hungarian Grand Prix". ESPN F1. ESPN EMEA Ltd. Retrieved 23 August 2010. ^ Ledsom, Mark; Ken Ferris (3 August 2008). "Motor racing-Hungarian GP gets extension to 2016". Reuters. Retrieved 7 April 2009. ^ T, Krisztián (9 August 2015). "Alpok Adria – Halálos baleset a Hungaroringen…" (in Hungarian). rvo.hu. Archived from the original on 8 December 2015. Retrieved 5 December 2015.